bleiPLUS combines the advantages of lead and tin. The typical strengths of lead sheet – durability, weather resistance and outstanding cold-forming properties – are retained. 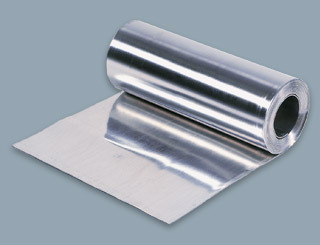 At the same time, the tin surface layer on both sides prevents any lead wear and the formation of white streaks. Over time, the initial shine of the patented product fades to a fine matt finish. 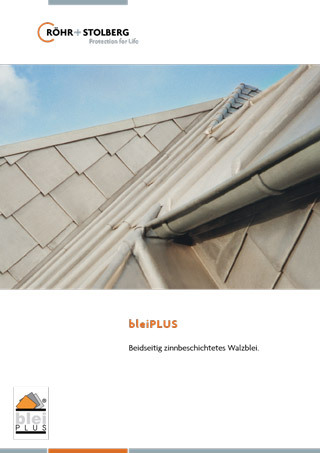 bleiPLUS thus helps to create striking, high-quality roof and façade surfaces. Time-consuming and costly patination of the sheets following fitting is eliminated. The tin coating enables the product to be soldered better and more quickly. bleiPLUS is suitable for sealing roofs and façades and can also be laid on large surfaces. Like all lead sheet products from Röhr + Stolberg, bleiPLUS is made from recycled lead and is ideally suited to recovering. bleiPLUS is certified with the Environmental Product Declaration of the Institute Construction and Environment e.V. bleiPLUS is also available in corrugated form.